In preparation for the new 6" x 6" paper pads I have on preorder, I'm desperately trying to use of scraps of what I already have on hand. 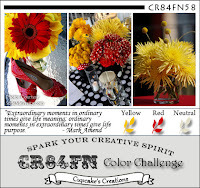 For inspiration I used the colors from CR84FN58 (Red, Yellow and a Neutral). 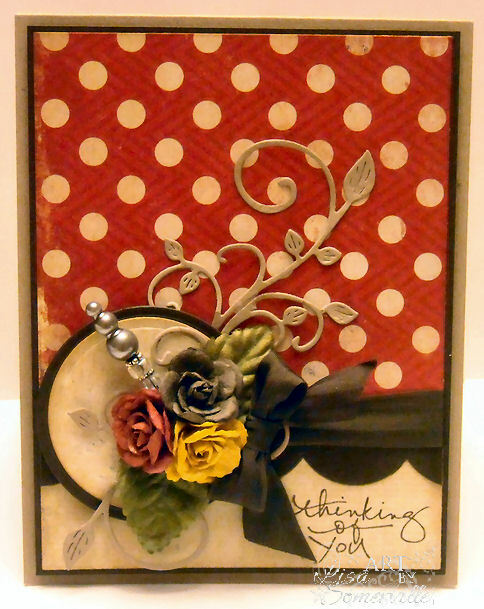 To embellish I added some Prima Doodle Deux Charm Rose Paper Flowers, Walnut Brown Vintage Seam Binding that was tied into a bow using Becca's Peg Bow Maker, Cheery Lynn Designs Mini Fanciful Flourish that was die cut from Kraft card stock, and a Stick Pin. OH, so pretty Lisa. Love the cluster of flowers with the pins and flourish. Pretty paper and ribbon. What a lovely way of using the CR84FN colors. 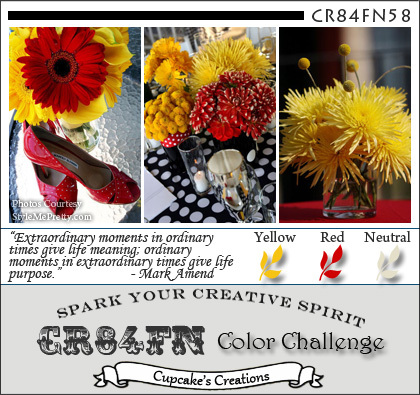 hi Lisa, I LOVE the colors you have used..my favs :) gorgeous card! Love this card, the seam binding with the flowers, just gorgeous! Lisa, I LOVE how you tied the seam binding into that FAB flourish! Your flowers are so Pretty and those papers are wonderful! THX for playing with us at CR84FN! Hi Lisa - love this card, the roses, pretty leaves and fabulous stick pin! Just lovely! Thanks for playing along with CR84FN! Gorgeous card Lisa, a great use of those scraps! I love the elegant flourish, so pretty! Gorgeous! Love the papers and the embellishments are perfect!